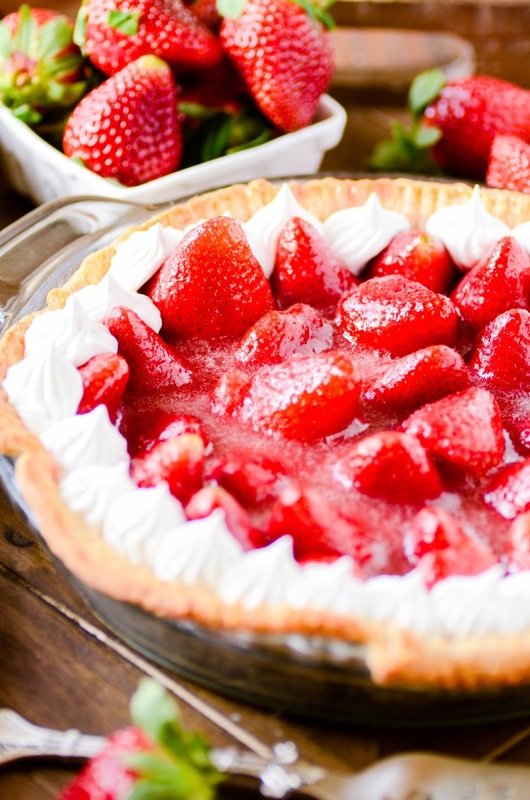 Delicious strawberry pie with a completely homemade filling. I chose to strain the seeds from the strawberry filling. Honestly, it was a gigantic pain and I'm not sure that it really mattered all that much in the end since the whole strawberries still have their seeds. Do what you will with that information. As for me, I don't think I'll strain out the seeds next time! Something else I think I'll do differently next time: slicing the strawberries. 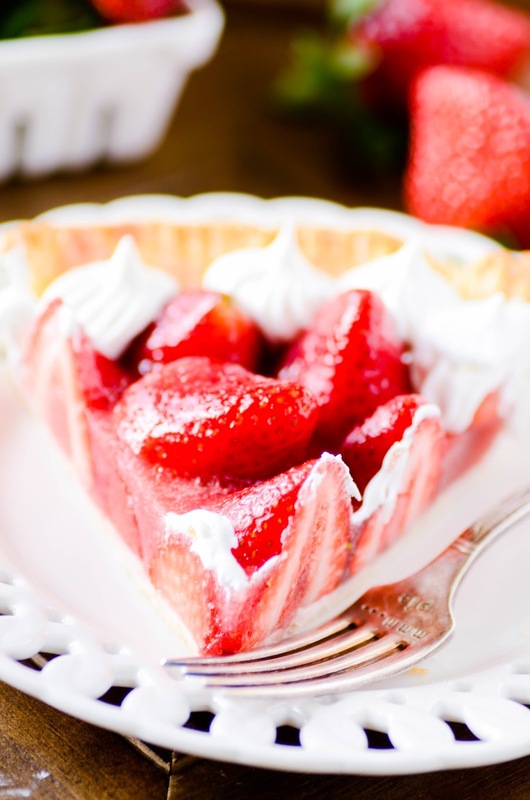 I thought it would be so pretty to have these beautiful, whole pieces of strawberries in this pie. And it is! But it also would have been easier to eat if I had sliced the strawberries instead. This buttermilk pastry crust is so yummy with this pie filling. But feel free to use a refrigerated pie crust from the store if you need to take a shortcut! What's my favorite thing about this recipe? The homemade strawberry "jell-o" filling is really really good. And I thought that would be my favorite part. But I think what I love most of all about this recipe is that it really allows the strawberries to be the star of the show. We've had some really amazing berries lately, and they were just perfect in this pie. In a small bowl, dissolve the gelatin into the 2 tbsp of cold water. Set aside and allow to soften. Take 1/4 of the strawberries and blend them until smooth. You may choose to strain the seeds out if desired. Over medium-high heat, whisk together the strawberry puree, sugar, cornstarch, and salt. Bring to a boil, then reduce heat to medium-low and allow to simmer for 2 minutes (or until the mixture thickens and is darker in color). Mix in the lemon juice and the softened gelatin. Stir until dissolved completely. Set aside, allowing to cool slightly. Slice the remaining strawberries and place them in a bowl. Pour the sauce over the strawberries and stir to coat. Pour the filling into the prepared pie crust. Chill until filling has set (about 2 hours). Top with whipped cream to serve. Love this type of pie. My mom used to serve this in her restaurant. Was a number one seller. Her recipe did have the strawberry jello in it.